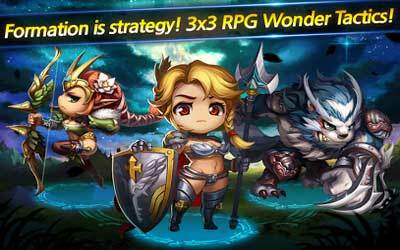 The wonderful Wonder Tactics APK 1.2.7, brings the adventure to the next height. As a new generation strategy RPG, you will find your place among the heroes to fight with different styles and strategies. Bring the knowledge and experience of yours to the limit in this new RPG experience. You will tackle yourself among 250 different characters you can choose, all with unique classes and backgrounds. As you fight with the heroes of Water, Earth, Fire, Light, and Dark, you will also play the story mode to unlock the legendary Heroes. Wonder Tactics still has more surprise up to its sleeve. Battles are commenced with unique and challenging gameplay. As you fight through the dungeons and face many different monsters and opponents, you can collect precious gems to strengthen your character. Customization of the characters can be done with ease, and you can break the limit by commencing evolution to the characters. With more strength, you can unleash the hidden potential of each character. Adding up with the right formations, you can ensure victory in your hand. Different enemies will require different formations, and you can change your formations and tactics during the heat of the battle. The Story mode consists of three different difficulties. With 150 dungeons, the adventure of Wonder Tactics will surely take a while. As you fight through different dungeons and bosses, you will unlock many items, heroes, and special dungeons. With Tower of Treasures, Secret Dungeon, Raid, Arena mode, and more hidden stuff, you will spend a while with this fun RPG. You can also fight against many different players around the world with the Player-versus-Player mode. While the gaming experience is free, you can add more features by purchasing in-game items. The fun and challenge of Wonder Tactics for Android is surely satisfying to complete. Glory Battlefield System & Reward modified.